These anatomically-shaped, Visco-Gel® arch pads provide instant support, comfort and relief of foot pain. Unlike bulky orthotics and insoles, these fit easily in every shoe style. Soothe heel and arch pain, limit excessive pronation to improve biomechanics and make shoes more comfortable. Self-adhering backing keeps them in place. Sizing is approximate. 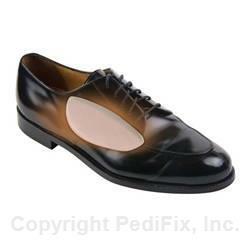 Position your ExtraArches in shoes before peeling off back, to test for placement and comfort. Make sure the inside of your shoe is free of powders or oils, so the adhesive will stick properly. Peel off backing and press in place. Can be placed under shoe insole or lining. Wipe with a damp cloth. Air dry completely before reuse. If you have diabetes or poor circulation, consult your physician before use. If numbness, discoloration, irritation or additional toe pain occurs, discontinue use immediately. If symptoms persist, visit a foot specialist.